When I was just starting out with my flute making journey, I made a couple of flutes that would not play – either at all, or not well enough. Over time, my knowledge and skills expanded, and today I know what kind of mistakes I did with these past flutes. There’s a benefit to patience. You can put the badly made flute aside for a couple of months, and go back to it when you finally know how to make the instrument. And with this knowledge, you can try and fix the flute. In this short tutorial, I will share some insights into fixing flutes and making them playable. If you have such flutes that won’t play, it may be a good time to fix them. 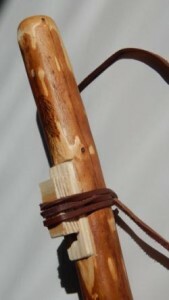 One of my first branch flutes, with a wolf block on the nest. The photo above shows my flute that is going to be fixed. It’s made of spruce. I made it a year ago and it was pretty fun to make it. The flute that required fixing was the second branch flute I ever made – this one actually made a sound. And it was almost tuned to scale. The problem with this little piece of spruce branch was that the sound was very, very airy and weak. The cause of the problem was badly created nest and sound mechanism. 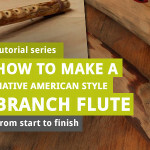 At the time, I knew little of how the Native American style flutes work, so I just made two holes and an air channel between them, remembering to create a splitting edge at the True Sound Hole. The TSH itself was round, created with an electric burner. 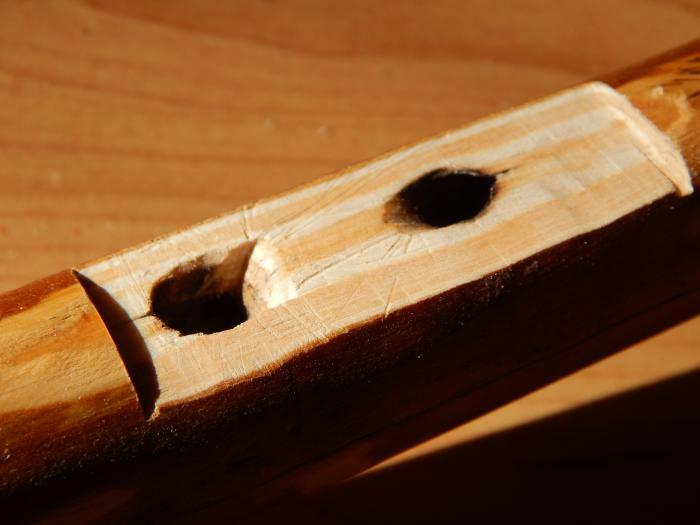 But there’s a math to every flute – while the True Sound Hole may be round, the rectangle shape TSH works better. The length of the air channel – the flue – matters as well and the size of the TSH is important. Finally, the cutting edge must be made at proper angle to split the air stream properly. 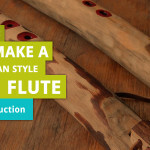 I had no idea about these things when I was making this flute. The original sound mechanism of the branch flute that had to be replaced. In order to fix the flute and make it work, I needed to rebuild the sound mechanism entirely because there was no other way to fix it. With some basic tools like a saw, a knife and some sanding paper,I got to work. The only way to replace the sound mechanism was to get rid of the old one, and glue on a new once, made of a separate piece of wood. After a lot of sanding. With a handsaw, I made two shallow transverse cuts, and I used a sharp knife to cut off wood between these cuts, and then level the nest and make it as flat as possible. Next, I used a sanding paper to sand down the newely leveled nest. The goal here was to make a flat surface with two big holes in it, and place a new piece of wood onto it with properly created sound mechanism. This way, the entire sound mechanism would change, and the air would be splitted properly, thus the flute would make a better sound. I picked up a small piece of flat wood I bought in a store similar to Home Depot (I guess, never been to US) and used a knife to shape it properly. 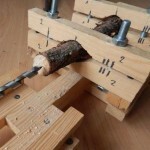 If I would have more advanced tools, I could cut a nice flat piece of wood from another spruce branch, but since I rely on basic handtools, I’m limited to using what I have lying around. New nest plate for branch flute after few minutes of sanding and drilling – it still needs a lot of work. 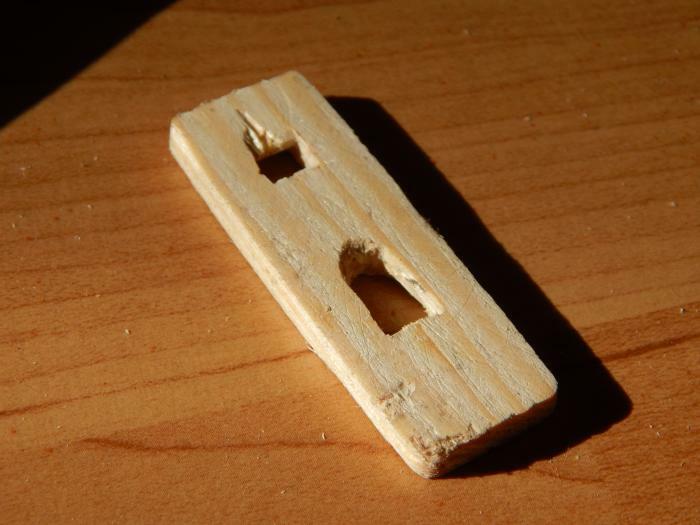 I drilled two small holes in the wood piece. Then, I used files to sand and shape the holes on the inside. Because the hole leading to the Slow Air Chamber had to be larger, I used a straight chisel to enlarge it. The True Sound Hole had to be shaped properly – it cannot be too large nor too small. The flute itself was 49 cm long and the bore length was 37. Bore was 1.6×1.3 cm wide – it was not round, really, more like an octagon. The new TSH was made into 4×7 mm. The ramp that splits the air stream needs to be made at 45 degrees angle, and slightly sanded down on the top when the air channel is carved in the nest, instead of being carved in the block. The new sound mechanism plate was ready. 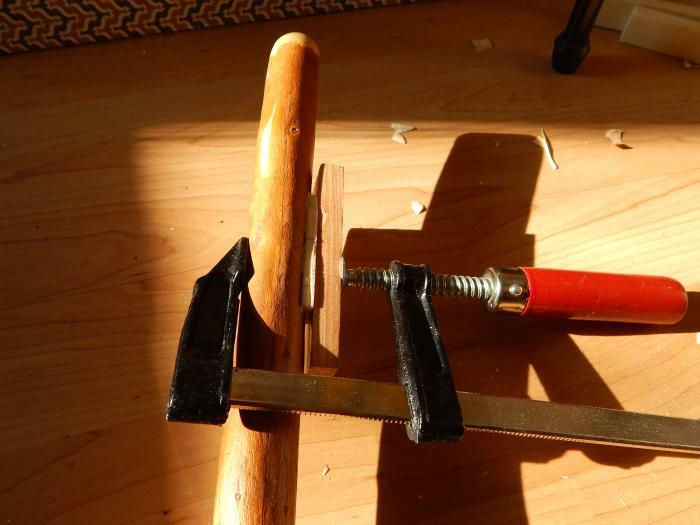 I used a wooden glue to attach it to the rest of the flute, and clamped it down using woodworking clamp. I left the flute to dry. Since small pieces of wood broke away from the new plate, I had to sand down the entire plate to make it flat again after the glue had dried. 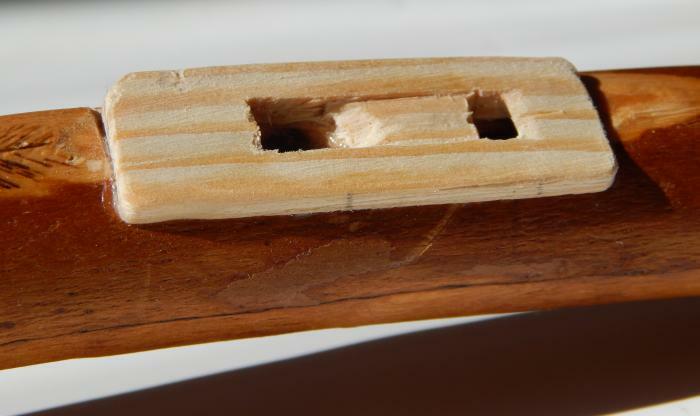 After placing the flute in a small vice, I have used a straight chisel to cut the air channel (flute) between the two holes and sanded it down. After more sanding with sand paper and files, the test block has been attached, and the flute made a new sound. It was still quiet, but now at least it was clear. Of course, after these little fixes the flute lost its tuning. I had to tune it again. Before the fixes it was tuned to F#4. Whenever you make changes to the nest and the sound mechanism, the flute’s tuning will break. And you will have to tune it again. Sometimes, it may be impossible to tune it. My suggestion is to always place the new True Sound Hole closer to the mouthpiece than the original TSH. It’s much easier to enlarge the finger holes than to make them smaller. New branch flute nest is done. It doesn’t look perfect, but it works. To tune the flute again, I made the flute shorter by cutting away piece by piece on the end, until the flute reached a stable G#4 sound. The rest was quite simple – the holes were in right places fortunately, they just needed a little touch. 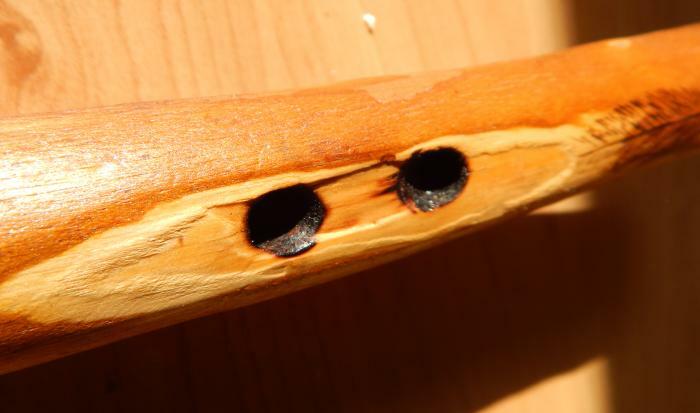 I used an electric burner to enlarge holes 6 through 2 (counting from the end of the flute) a bit, while the first hole (the one closest to the sound mechanism and the mouthpiece) was almost in tune already. I’ve recorded a final sample of the almost fixed flute – the tuning still need a little bit of work, but it sounds pretty good. So here’s a sample of Cheyenne Love Song :). 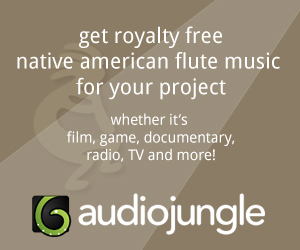 The flute has been fixed – it makes a sound and it is almost tuned. It’s not loud and it doesn’t look great, but at least it works and plays music. I still need to oil and wax the new wooden plate, but these are minor details to attend. 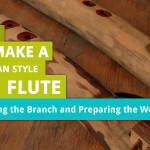 You do not have to throw away the flutes that doesn’t work – if you’re a beginner, it’s quite possible that in a few months, you will learn enough about flutemaking to fix these first instruments. And from every fix and every mistake you can learn a lot of new things.